The House of the Faun, situated on the north side of the Via della Fortuna (pictured below), is named after the statue of a dancing faun found there. It is a fine example of the result of the fusion of the architectural models of the Italic house centred around the atrium and the Hellenistic peristyle dwelling. It occupies an entire insula and was built over an earlier 3rd century BC dwelling which, with its hortus, was on the site of what is now the first peristyle (g). 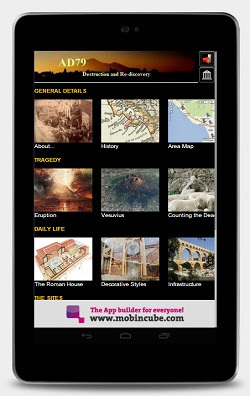 The house, discovered and excavated around 1830, was built in two phases, the first dating to the early 2nd century BC and including the first peristyle, and the second to the late 2nd century BC in which the second peristyle was added and the final size was established. In front of the main entrance is the word HAVE, meaning welcome, spelled out in the footway with fragments of coloured marble. A small vestibule opens onto the fauces (a) (pictured right) which has a richly decorated floor consisting on small triangular pieces of coloured marble and slate. At the inner edge it was separated from the floor of the atrium by a strip of finely executed mosaic (now in the Naples Museum) portraying two tragic masks in the midst of fruits, flowers and garlands (pictured below). The fauces is decorated in the first style to a height of about 2.5 metres. Above this on either side is a tufa shelf on which rests a lararium consisting of a temple facade with small Corinthian columns. The fauces leads into a large rectangular atrium (pictured right). The sombre shade of the floor, paved with small pieces of dark slate, formed an effective contract with the white limestone edge and central impluvium which is covered with pieces of coloured marbles. The walls of the atrium were decorated in the first style in shades of red, blue and yellow above a lower black frieze. The upper zone was left white. On either side of the atrium are cubicula while at the rear is the tablinum (d) (pictured below) which has a broad window in its north wall opening onto the colonnade of the first peristyle. In the centre of the floor is a rectangular section paved with egg-shaped pieces of black, white and green stone; the rest of the floor is of white mosaic. Doors either side of the tablinum opened onto large triclini (e) and (f). Both had large windows overlooking the first peristyle and the one on the left (west) also had a door opening onto the colonnade. In one the mosaic picture on the floor is of fish and sea monsters; in the other the picture is of a boy (the Genius of autumn) sitting on a panther. The grouping of the combatants, the characterization of the individual figures, the skill with which the expressions have been captured and the delicacy of the colouring give the picture a high rank among ancient works of art. Patterns of wear on the mosaic suggest how it might have been viewed by guests of the house. A copy of the mosaic has now been placed in situ while the original can be seen in the National Archaeological Museum in Naples. The cubiculum (n) was decorated in the second style and contained the remains of two beds. The room next to it (l) was undecorated at the time of the eruption and was used as a wine cellar. At the rear of the peristyle the small rooms include the doorkeeper's room, and to the west niches for the household gods. The domestic apartments were entered by the front door (1). The vestibule, unlike that of the main entrance, is open to the street, the fauces being longer and narrower. The Tuscan atrium (2) has four substantial Corinthian columns. The alae (3) here are in the middle of the sides; the one at the left (west) served as a passageway between the two atria. This part of the house was badly damaged by the earthquake of AD62, and there are many traces of repairs. The walls were simply decorated in the fourth style. A long corridor on the east side of the first peristyle connected the rooms on the east of the small atrium with the private bath suite (o), the kitchen (m) and cubiculum (n). The two rooms of the bath suite, tepidarium and caldarium, were provided with hollow floors and walls, and were heated from the kitchen next door. The house has two separate entrances, set in a row of shops. 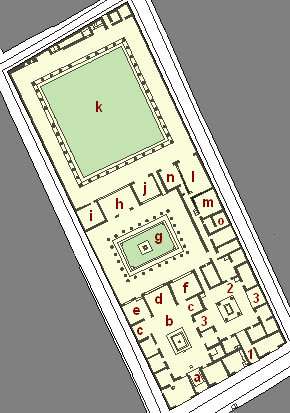 The apartments behind are arranged in four groups; a large Tuscan atrium (b) with living quarters on three sides; a small tetrastyle atrium (2) with rooms for domestic service around it that extends on the east side towards the rear of the house; a peristyle (g), the depth of which equals the width of the large atrium and half that of the small atrium and a second peristyle (k) occupying more than a third of the insula. At the rear of the second peristyle is a series of small rooms, the depth of which varies according to the angle of the street at the north end of the insula. The floor of each ala (c) was ornamented with a mosaic picture. In that at the left are doves pulling a necklace out of a basket, while the mosaic picture at the right, now in the Naples Museum, is divided into two parts; above is a cat with a partridge; below, ducks, fish and shellfish (pictured below). The colonnade of the first peristyle was single storeyed. The entablature of the Ionic columns presents a mixture of styles with a Doric frieze and a dentil cornice. The wall surfaces were divided by pilasters and decorated in the first style. In the middle of the garden is a marble fountain (pictured left). On the north side of the peristyle is a broad exedra (h) fronted by two columns with an almost full width window at the rear (pictured left) opening onto the second peristyle (k). Between the columns at the entrance were mosaic pictures of wild creatures of the Nile - hippopotamus, crocodile, ichneumon and ibis (a detail is pictured below). In the room itself, filling almost the entire floor, was the most famous of ancient mosaic pictures, the battle between Alexander and Darius. The mosaic is a reproduction of a painting made either in the lifetime of Alexander, or soon after his death, possibly by Philoxenus or Eretria. The battle is perhaps that at Issus. The left side of the picture is only partly preserved. A corridor to the east of the exedra leads from the first to the second peristyle. The columns here, of the Doric order, are of brick with tufa capitals (pictured below). The entablature rested on a line of timbers and the colonnade may have been in part two storeys high. On either side of the exedra (h) are triclini (i) and (j), one open its entire breadth onto the second peristyle while the other has a narrow door with two windows.